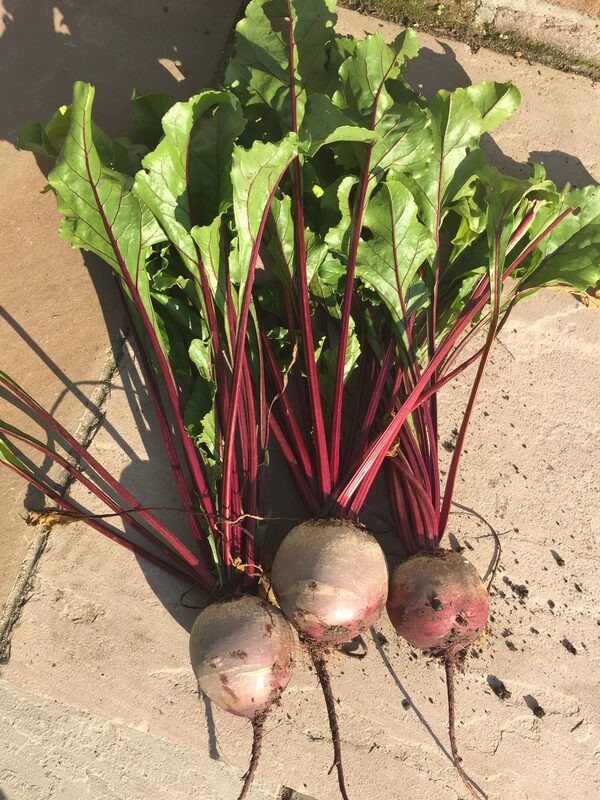 Whether you are looking for some ideas on how to use up a glut from the garden or simply love beetroot I've got a few new beetroot recipes that I hope you'll love. Beetroot is at its absolutely peak round about now. The seeds I planted back at the end of March are now a really good big size – perfect for boiling, juicing and turning into chutney. The second sowing I did in mid June are about the size of a tennis ball and lovely and sweet just roasted. Beetroot are a joy to grow and need very little attention. Nothing tends to eat them (apart from my chickens who can strip a beetroot plant of all its leaves in under 5 seconds if I let them and my mum who tends to visit more than usual around this time of year foraging for free veg). They don’t kick up a fuss and look all pathetic if I forget to water them for a day or so and they are quite happy sat in the ground until I’m ready to eat them. I’ll pull them all up and store them about November time but until then they are quite happy sat in their raised bed inspiring me with new ways to cook them every time I look out of the window. My favourite way to eat beetroot is just simply as a roasted vegetable. I peel and cut it into chunks and then wrap in a foil parcel with a good sprinkling of water (about 1 tablespoon) and some salt and pepper (sometimes add some cumin seeds which I think go really well with beetroot). The parcel is then popped in the oven for approximately 40 – 50 mins depending on the sizeof the chunks and oven temperature. Beetroot are very well behaved and I usually pop them in the oven with whatever else I’m cooking. They aren’t too fussy about temperature. They are done when they are nice and soft when pierced with a skewer. You should’t feel any resistance. I always cook extra as they are lovely cold thrown onto salads. I also steam the beetroot leaves and have them alongside as a green veg. If you’ve not done that before give it a go. They taste like a mix of spinach and kale. Delicious. 2 veg for the price of one. Not many other vegetables have that claim to fame. I do however have far too many beetroot just to eat it as a side veg so I need to find some new recipes that will help me use up my glut. A chutney, a fritter and a risotto seemed a good place to start. Nothing like eating a bowl of shocking purple food to put you in a good mood. This is almost too pretty to eat. I sometimes make this with the kale and hazelnuts and eat it by itself. When its cold and I’m craving something a bit more filling I’ll just make the risotto and serve with slow roasted pork belly and the steamed greens from the beetroot. First peel and grate the beetroot. It’s not the nicest of jobs – unless you like having stained purple hands. I tend to peel with a vegetable peeler and grate using my food processor. 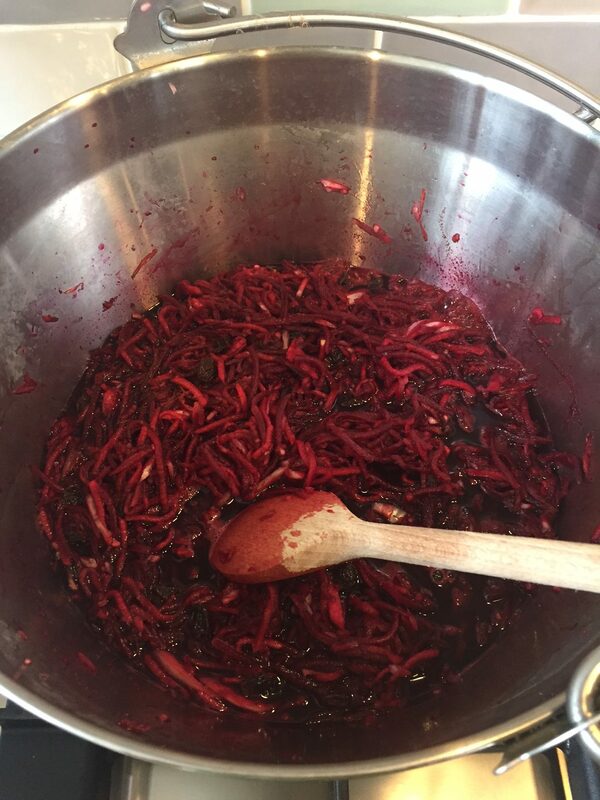 Put the grated beetroot in a saucepan with the vegetable stock and simmer for 10 mins. Melt the butter in a second saucepan and sweat the onion for 5 mins until soft. Add the garlic and sage and cook for another minute. Add the risotto rice and coated in the melted butter and stir until the rice starts to turn translucent. Pour in the vermouth or wine and stir until the liquid has been absorbed. By now your beetroot and veg stock mixture should have been bubbling for 10 mins or so. Add the beetroot and stock mixture a ladle at a time. Keep stirring as the liquid is absorbed. It should take approximately 20 mins or so to add all the liquid. After 20 mins or so taste the risotto – it should be soft with still a little bit of bite. If it’s too hard add a ladle of boiling water from the kettle until it’s at the consistency you like. Once the rice is done to your liking turn out the heat, add the second nob of butter, the squeeze of lemon juice, a grating of parmesan and the 25g goats cheese. Give it a final stir and then let the risotto sit covered with a tea towel for 3 to 5 mins. Meanwhile tear the kale into bite sized chunks, toss in some olive oil and bake in the oven for 20 mins. Add the hazelnuts on a different baking tray for the last 7 to 8 mins. Roughly chop the hazelnuts once they are cooked. After its sat for a few minutes give the risotto a stir to make sure the cheese is distributed evenly. 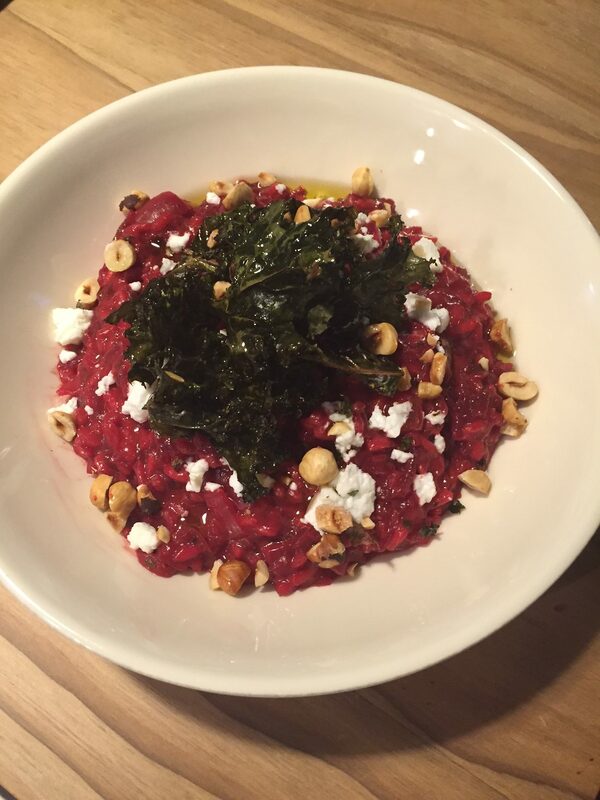 Serve the risotto in a big bowl with extra goats cheese and the hazelnuts scattered over and topped with the crispy kale. Beetroot and horseradish – one of those food combinations that just work. I do a recipe with scallops with beetroot with a light horseradish sauce in winter that is really lovely. 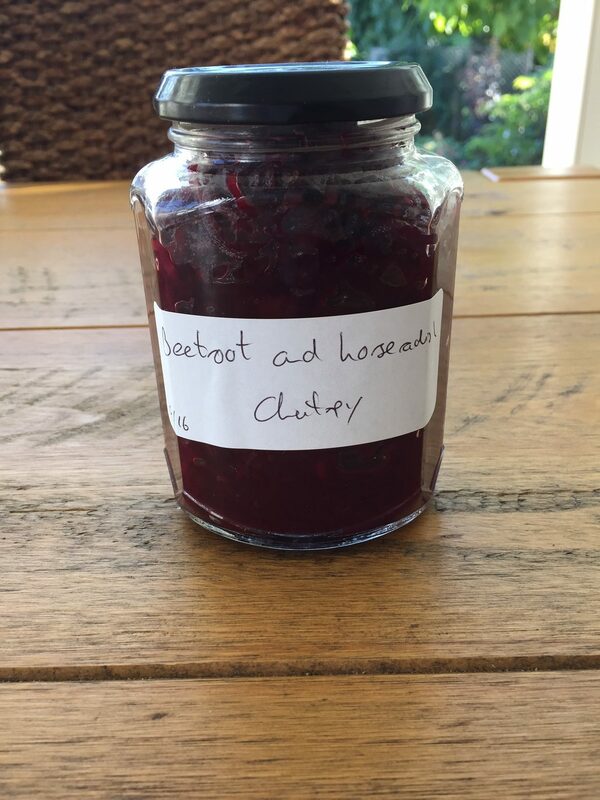 I’ve seen jars of beetroot and horseradish chutney being sold in garden centres and the like so thought I’d see if I could make my own. I think its lovely. You may want to add an extra tablespoon of horseradish. I wimped out but it could take a stronger horseradish favour if you are a big fan. This goes really well with ham or smoked salmon. Makes approximately 4 to 5 jars. The chutney is cooked when the liquid has nearly all been absorbed. If you pull a wooden spoon through the mixture it shouldn’t immediate fill back up again with liquid. Also make sure you taste it. The beetroot should be soft and nice and sweet. Sterilise some jars. For details on how to do that see my blog on jam making. Seal tightly and leave to go cold. This will mature nicely over a few months unopened – if you can wait that long. Once opened store in the fridge and eat within a couple of weeks. There aren’t many vegetables I don’t decide to turn into a fritter at some point once boredom strikes. After months of eating spiced courgette fritters with tomato salsa I feel in need of something slightly more autumnal (great word that). 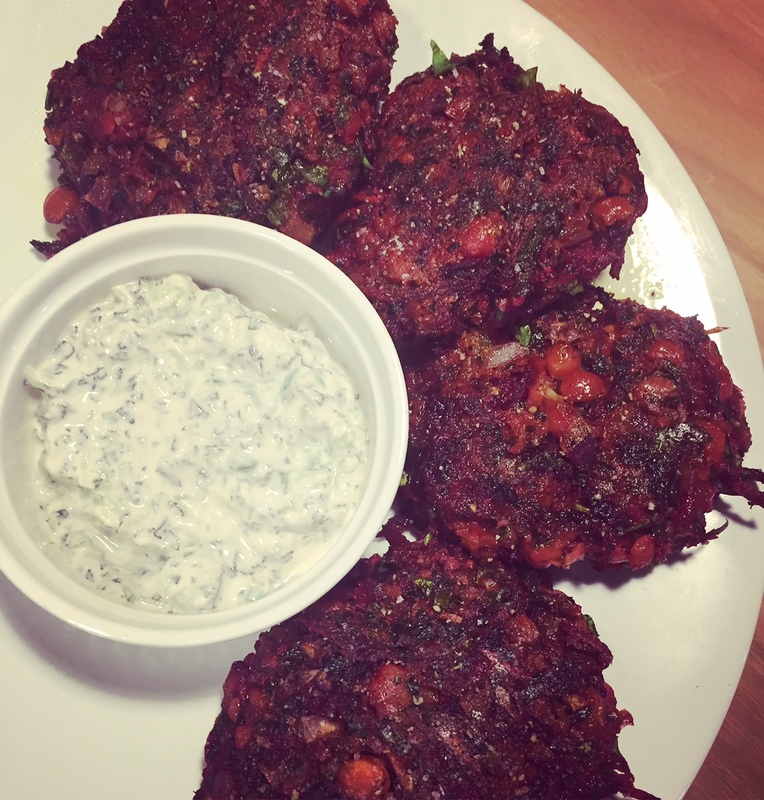 Both Nigel Slater and Ottolenghi make their beetroot fritters with chickpeas so that seemed like a good place to start. Here’s my version. Drain the tin of chickpeas into a bowl and roughly mash with a potato masher. 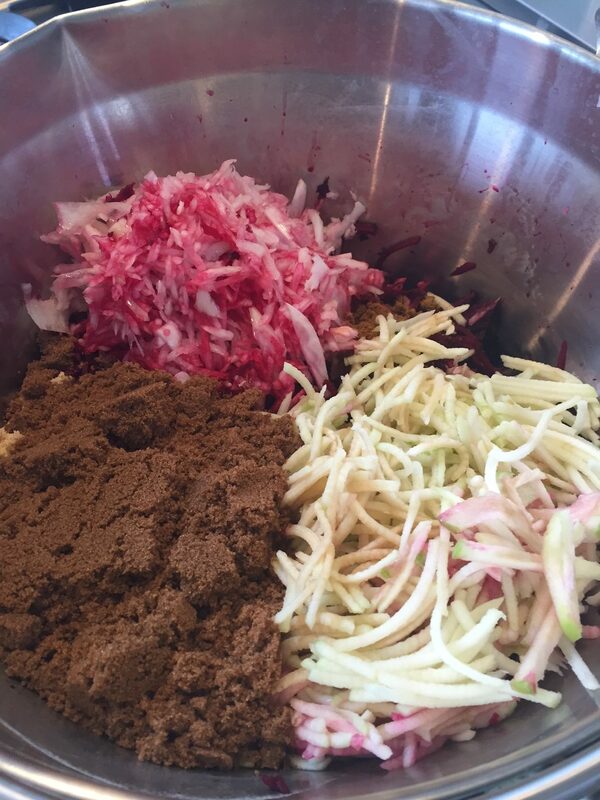 Add the grated beetroot, finely chopped onion, the spices, the chopped coriander, the flour and plenty of seasoning. Mix together. Fritters always seem to work better when mixed with your hand rather than a spoon. This one is no exception. Using your hands shape the mixture into 6 to 7 patties. If time cover and place in the fridge for 20 to 30 minutes to firm up. Squeeze the cucumber in your hand to get rid of as much of the liquid as possible. Mix the cucumber into the yogurt mixture along with the chopped mint. Serve the patties with the tzatviki served alongside.